Thompson Town Hall (6741 Madison Road / Thompson) on Tuesday, April 16th from 7:00 p.m. – 9:00 p.m.
GCPL Bainbridge Branch (17222 Snyder Road / Chagrin Falls) on Wednesday, April 17th from 7:00 p.m. – 9:00 p.m.
For the past year, GCPL has been working with the design, architect and building teams on facilities renovations and new constructions in Bainbridge and Thompson. As plans are being firmed up on the materials, design and timelines, the library would like to share the status of these projects with the community and invite citizens to preview renderings. These dates are the fourth in a series of community conversations where library personnel, project leaders, and citizens have been invited to share their ideas on the types of features they would like to have incorporated into their libraries. “We have been gathering information from citizens for months, and as we get close to commencing with the actual building, we would like to offer another opportunity for citizens to collaborate and share their ideas,” says GCPL Director Ed Worso. Geauga County Public Library is committed to being an excellent resource and partner in furthering the interests of the Geauga County community and its residents. Incorporating community input into building designs is an important part of the planning and building process. The design professionals from CBLH and Perkins & Will as well as the construction team from Donley’s will be on hand to share the status of the projects and answer questions. 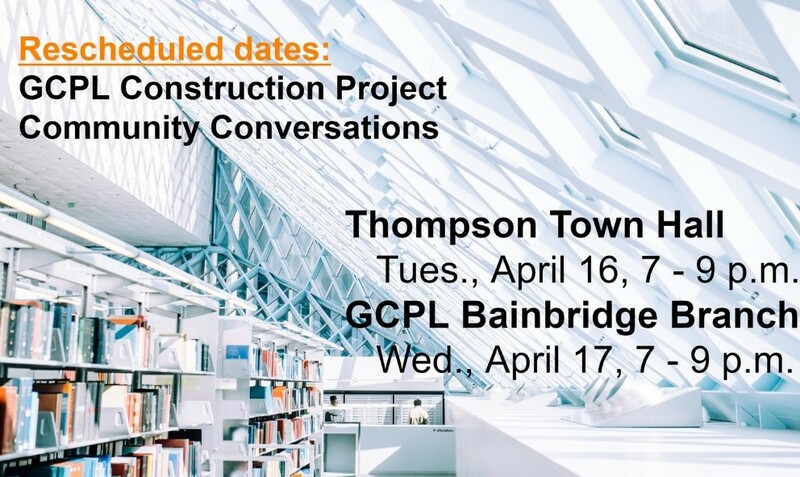 Pictured In Cover Photo: GCPL invites citizens to attend community conversations in Bainbridge and Thompson regarding the status of upcoming building projects. Visit http://ow.ly/6xh950nslZe to register.